The aim of this research was to examine empirically a theoretical model of psychosocial safety climate (PSC). This emerging construct is defined as the 'policies, practices and procedures for the protection of worker psychological health and safety' (Dollard & Karasek, 2010, p. 208) that are largely influenced by senior management in organisations. We propose an integrative model where PSC is a precursor to work conditions (i.e. job demands and job resources) and in turn burnout, engagement and performance via mediation pathways. 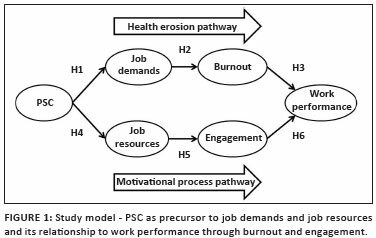 In particular, our theory builds on the premises of Job Demands-Resources (JD-R) theory (Bakker & Demerouti, 2007) and we see PSC as precursor for the health and motivation pathways espoused in that model. The research addresses a gap in the literature about the origin of job demands and job resources and in turn the model pathways. Psychosocial safety climate theory brings together insights from the work stress and safety science literatures. Although numerous work stress studies have identified a range of important psychosocial aspects, none has specifically identified a psychosocial safety climate. Further, two disparate lines of research separately explain workplace physical and psychological health (Dollard & Bakker, 2010). The first, safety climate research, examines safety behaviours and perceptions and their influences on employees' physical health (Flin, Mearns, O'Connor, & Bryden, 2000; Zohar & Luria, 2005). The second focuses mainly on work conditions, job demands and resources, worker psychological health and motivational related outcomes. Psychosocial safety climate is largely an indicator of the true priorities of an organisation towards competing climate interests, for example, a climate for productivity vs. a climate for psychological health. According to leading theorists in the safety climate literature, the best way to make sense of an organisation's true priorities is via perceptions of enacted policies, practices and procedures (Zohar & Luria, 2005). Other perceptual or sense-making cues may be derived from the divergence or convergence between what management say and what they do in relation to these operational aspects. These perceptions in aggregate provide a measure of climate, because PSC is argued to be a property of the organisation, team, or unit. Knowing about the climate will provide a good indication of the working conditions (i.e. job demands and job resources), worker psychological health, engagement and productivity of employees. Despite a plethora of organisational climate constructs (for a review, see Kuenzi & Schminke, 2009), none appear to relate specifically to psychological health and safety (freedom from psychological harm) climate. The PSC construct shares some similarities with other safety climate constructs (Zohar, 1980) and team psychological safety (Edmondson, 1999) but is also different. PSC is an antecedent to working conditions that relate to psychological health and safety. The concept of PSC is derived in part from the notion that external factors affect how working conditions are created (see Sauter & Murphy, 2003); how senior management within the organisations reacts to such external forces determines PSC (Dollard & Karasek, 2010). For instance, the pressure of external competition may lead senior management to introduce lean production systems that are detrimental to workers' health. By using this principle, we believe that working conditions (i.e. job demands and resources) derive from initiatives of senior managers as discussed in the previous section. It might be argued that PSC is related to psychological safety as defined by Edmondson (1999). Psychological safety is related to employees being safe and able to speak out without being rejected or punished (Baer & Frese, 2003); in turn employees' perception should enhance their work performance (Baer & Frese, 2003), or team learning behaviour (Edmondson, 1999). We expect that in high PSC climates, psychological safety will be an outcome. High PSC environments would also lead to greater safety in the form of freedom from more serious psychological injury that could arise from psychologically damaging actions of others, including bullying (see Bond, Tuckey, & Dollard, 2010). Job demands refer to any aspect of the job that requires people to expend physical, cognitive and emotional effort (Bakker & Demerouti, 2007). In other words, they refer to 'things that have to be done' (Schaufeli & Bakker, 2004, p. 296). Job resources (e.g. job control and supervisory support), energise workers towards work goals and stimulate personal growth (Demerouti et al., 2001) and can minimise the impact of job demands on employees' well-being (Bakker, Demerouti, & Euwema, 2005). Theoretically, burnout is negatively related to performance in JD-R theory as well (Hypothesis 3). There is empirical evidence for a negative relationship between burnout and (objective) performance (Bakker et al., 2008; Demerouti, Verbeke, & Bakker, 2005). Following Hockey's (1997) assumption regarding the passive coping mode, we assume that people who are trapped in negative affective-cognitive states (including burnout) are likely to reduce their work accuracy and effort as a mechanism to cope. In extreme cases, people may not pursue their tasks at all (Schaufeli & Bakker, 2004). In sum burnout may be related to reduced performance through an erosion of personal energy (Schaufeli & Bakker, 2004) and less striving for achievement (Halbesleben & Bowler, 2009). The motivational process of the JD-R model is driven by the availability of resources (Schaufeli et al., 2009). We argue that in high PSC environments, managers will ensure that adequate job resources are available for employees; in other words, PSC is positively related to job resources (Hypothesis 5). Therefore, managers will understand through good communication and feedback systems with employees, what job resources are required to help employees achieve both personal and work related goals. If management is concerned about employees' psychological health and safety, this will lead to a better working environment via a supply of various job resources (e.g. decision authority, supervisory support). Finally, we expect that work engagement will be positively related to performance (Hypothesis 7). Although there is currently a lack of studies that examine the link between engagement and work performance (Bakker & Demerouti, 2008) there are several reasons why engaged workers should perform better than non-engaged workers (Bakker, 2009). Engaged workers often experience positive emotions such as happiness and enthusiasm. According to the broaden-and-build theory (Fredrickson & Branigan, 2005), positive emotions broaden one's focus and attention to a more expansive set of stimuli in the environment; when attention is broad the individual can develop and build personal skills and resources. For example, joy may encourage the exploration of novel situations and the development of new skills in problem solving. Secondly, engagement is related to health and this implies that workers are able to perform better. Finally, engagement may be closely related to positive work performance because of the focus and energy engaged worker bring to the task (Schaufeli & Bakker, 2004).  'In my workplace senior management acts quickly to correct problems/issues that affect employees' psychological health' (management commitment; α = 0.86).  'There is good communication here about psychological safety issues which affect me' (organisational communication; α = 0.67).  'Senior management clearly considers the psychological health of employees to be of great importance' (management priority; α = 0.80).  'Participation and consultation in occupational health and safety issues occurred with employees, unions, and occupational health and safety representatives' (organisational participation, α = 0.77). Job demand: These were assessed using emotional demands (three items) and role conflict (four items), from the Copenhagen Psychosocial Questionnaire (COPSOQ; Kristensen, Hannerz, Hogh, & Borg, 2005). Answers were on a 5-point scale: 0 (strongly disagree) to 4 (strongly agree). A sample question for emotional demands comprises 'Does your work put you in emotionally disturbing situations?' A sample question regarding work role conflict is 'Do you do things at work that are accepted by some people but not by others?' The reliability of the scales is α = 0.82 and 0.82, respectively. Job resources: We examined job resources by using two subscales: supervisor support and decision authority from the Job Content Questionnaire (JCQ) (Karasek et al., 1998). Supervisor support was assessed using five items including; 'My supervisor/manager is concerned about the welfare of those under him/her' (α = 0.85). The response formats used four points: 1 (strongly disagree) and 4 (strongly agree). However, this scale also includes an additional point, 5 (I have no supervisor) for those people where supervision is not applicable. As there were only 2.8% of non-applicable responses, we treated these as missing values. Decision authority was assessed using two of the original three items, for example, 'My job allows me to make a lot of decisions on my own' (α = 0.63). Response formats to both scales used four points: 1 (strongly disagree) and 4 (strongly agree). We omitted a reversed item due to low reliability. Both of these scales are from the Malay version of the JCQ (Edimansyah et al., 2008). Burnout: This was examined using two sub-scales of the Maslach Burnout Inventory-General Survey (MBI-GS: Schaufeli, Leiter, Maslach, & Jackson, 1996). For emotional exhaustion, we used five items, for example, 'I feel emotionally drained from my work'. For cynicism, we used four of the original five items. Consistent with Bakker et al. (2008) and Schutte, Toppinnen, Kalimo and Schaufeli (2000), we omitted one item, 'I just want to do my job and not be bothered' due to low reliability. An example item is: 'I doubt the significance of my work'. Responses were scored on a 7-point scale: 0 (never) to 6 (always) (α = 0.83 and 0.67, respectively).  'I am enthusiastic about my job' (dedication). Firstly, we conducted a descriptive analysis to examine inter-correlations between all variables (see Table 1). Secondly, as we conducted a cross sectional study, we used Harman's one factor test to determine whether common-method variance is a serious problem (Podsakoff & Organ, 1986). An unrotated factor analysis of all study items yielded 11 factors in total explaining 60% of the variance. Given that a single factor did not appear and that a general factor did not account for most of the variance, common method bias is not viewed as a significant threat in our study (Podsakoff & Organ, 1986). Moreover the factors were generally the same as those used as indicators in Figure 2. Thirdly, we tested a variety of models with structural equation modeling using AMOS version 17 (Arbuckle, 2003) and tested the progressive fit of models using the chi-square difference test. We evaluated our model by using five absolute fit indices (cf. Joreskog & Sorbom, 1986): the chi-square statistic (χ2), goodness-of-fit index (GFI), comparative fit index (CFI), Tucker-Lewis index (TLI) and the root mean square error of approximation (RMSEA). For GFI, CFI and TLI, values greater than 0.90 are acceptable whereas for the RMSEA a value equal to or smaller than 0.08 is acceptable (Byrne, 2001). PSC job demands burnout performance, PSC job resources engagement performance, with PSC to all model variables, PSC burnout, PSC engagement and PSC performance. PSC job demands burnout performance, PSC job resources engagement performance. The proposed mediation model fit the data adequately (GFI = 0.94; CFI = 0.94; TLI = 0.93; RMSEA = 0.06). Against the M0 model, the M1 model showed a significant improvement with Δχ2 significant at p < 0.001 (see Table 2). PSC burnout (β = -0.15; p < .05) and PSC performance (β = 0.17; p < 0.05). We found that M3 was not as good a fit with GFI = 0.89; CFI = 0.86; TLI = 0.83 and RMSEA = 0.10. Nevertheless, results here showed that PSC was related to performance (β = 0.34, p < 0.001); in other words, this provides some evidence that there is a direct effect to be mediated. with additional paths PSC burnout and PSC performance (M1 plus the two additional direct paths). Again, we used a direct test of the mediation motivation pathway as indicated in Hypothesis 8. Bootstrapping results showed that the indirect path between PSC and engagement was influenced by job resources (indirect effect = 0.938, 95% lower CI = 0.06, upper CI, 9.00, p < 0.01). Additionally, our analysis showed that engagement carried the effect of job resources on work performance (indirect effect = 1.030, 95% lower CI = 0.50, upper CI = 2.81, p < 0.05). Together, our finding suggests that when PSC is high, higher levels of job resources are supplied to fulfill employees' needs and this increases employees' engagement. In turn, engagement carries the effect of resources on performance. 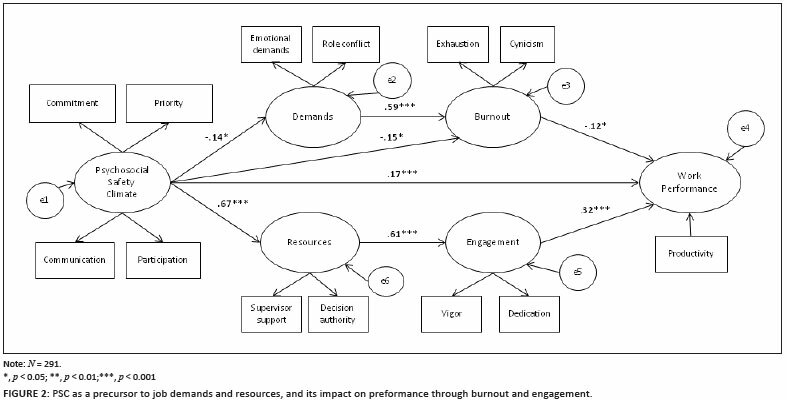 Instead, we found that PSC was related to performance via burnout. Although we proposed that the negative direct effect of PSC to burnout may be plausible as an 'offence to self' stressor (Semmer et al., 2005), the direct effect may also be explained by other demands not assessed in this study. The theoretical implications of our research are in general that the integrative PSC model is applicable in an Eastern, developing economy. In other words, the integrative model has etic qualities. Taken together, the evidence point towards the benefit of expanding the JD-R model to include PSC as a trigger to the main pathways of the model. Importantly, the evidence supports the proposition that PSC is a source of job demands and job resources and helps to answer the question, 'from where do job demands and resources arise?' When managers in organisations prioritise psychological health over productivity concerns we expect working conditions to be designed to be conducive to both health and work engagement (Dollard & Karasek, 2010). There are some limitations to the current research. The current study used cross-sectional data therefore causal conclusions regarding the direction of the proposed relationships cannot be drawn. However, previous longitudinal research lends some support to the proposition that PSC precedes work conditions (Bond et al., 2010; Dollard & Bakker, 2010). Further, our population-based study did not provide the opportunity for aggregation of data, therefore it is plausible that the perceptions of organisational PSC could be influenced by individual factors. Additionally one of the possible problems caused by cross-sectional research is common-method variance (Demerouti et al., 2005). To assess this problem, we conducted the Harman test and found no common factor underlying all of our measures. Therefore, we believe that the relationships we report are substantive and not based on common method effects.